Crovie is a 200y fishing village and a Designated Conservation Area near Banff, Scotland. 64 Crovie is a cosy well equipped self catering cottage and the ideal place to relax and get away from it all. Backs onto the Seaside and the rockpools. Crovie is a small unique village situated on the Moray Firth around 40 miles from Aberdeen and 10 miles from Banff. It is a historic 200 year old fishing village and is now a Designated Conservation Area. The cottages are just 6 feet from the sea and there is no through road so it is the ideal place to relax, unwind and watch the sea and wildlife. 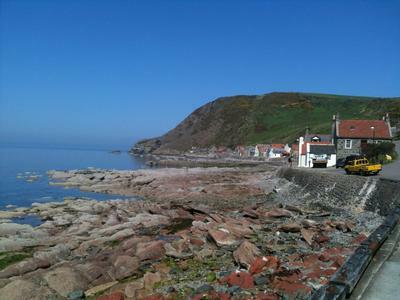 Crovie is a bird watching paradise and it is close to the rspb reserve at Troup Head - Scotlands' only gannet colony. There are a number of boat/fishing trips available around the coast from Macduff and Banff to see the birds and variety of marine life in the area including seals and if you are lucky the Moray Firth Dolphins ! 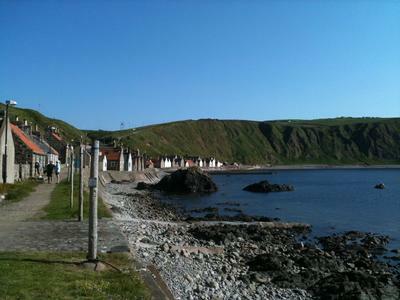 Crovie is 3 miles from Pennan, famously used in the film Local Hero. There is a pub, cafe and a shop in Gardenstown where you can walk to around the cliffs. Further afield there are a variety of activities including sandy beaches at Cullen, golf courses, castle and whisky distilleries. You may just want to sit, relax and watch the world go by. 64 Crovie is a cosy fishermans cottage. Downstairs features hallway, kitchen/dining room with wood burner, shower room and lounge. Lounge and dining rooms look directly on to the sea. Upstairs are two spacious twin bedded rooms with ample storage space. The cottage is comfortable and very well equipped. Please check availability on the calendar before making an enquiry. Contact Fiona Angus for Enquiries and Availability.